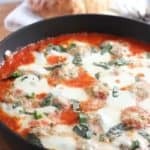 With or without pasta these Chicken Parmesan Meatballs with Creamy tomato sauce will become a family favorite! Line a large sheet pan with foil for easy clean up. In mixing bowl, combine all meatball ingredients together. Careful not to over mix as it make the chicken tough. Shape in 1 1/2 inch balls and place on prepared baking sheet. Bake for about 12-15 minutes - Don't worry if slightly undercooked they will finish off in the sauce. Melt butter in large oven proof skillet. (if you don't have one, use a regular skillet and transfer to baking dish when sauce is done). Cook onion until translucent. About 5 minutes. Add garlic, cook for one minute until fragrant and slightly soft. Add crushed tomatoes, chili flakes, salt and pepper to taste. Bring to simmer. Cook for about 5 minutes. Add cooked meatballs to sauce. Top with mozzarella. Bake for about 20 minutes until all bubbly and cheese has melted.